If the DOC staff cultivates a collaborative culture of service to understand and anticipate needs, communicate processes and the rationale for decisions, and ensure high quality services are accurate, timely, and reliable, then staff and school communities will have the appropriate resources and supports to accomplish their mission. Our top priority is to have all our staff focused on completing tasks in compliance with all county, state and federal regulations with the success and well-being of students in mind. We believe our work is focused on the success of all students and employees; learning is achieved through creativity, innovation, focus, and hard work and lifelong learning for adults is essential to success of students. Therefore, we will model our commitment to achieve continuous improvement, foster professional learning communities that develop a high-performing workforce, and provide professional growth opportunities and support for all employees. We believe that meaningful collaboration with staff, and school communities is a vital ingredient of our office’s success; stakeholder relationships make the Division of Controller more effective and help others fulfill their missions; and strong partnerships are built on trust and open and honest communication. Therefore, we will know and seek to understand the perspectives, experiences, and needs of our customers, build strong, mutually supportive relationships with the customers, departments, divisions, schools, or offices we serve, and use interest-based and other collaborative methods to identify and achieve mutually agreed upon goals. We are committed to maintaining high performance standards and to fulfilling reasonable customer expectations through flexibility and creativity in overcoming obstacles. We believe that respectful behavior generates trust that leads to excellence and high productivity; each individual staff member’s contributions add value to the quality of our services; and each individual should be treated with integrity, honesty, and respect. Therefore, we will model civility in all interactions and encourage open and honest communications, provide opportunities for stakeholders to voice their opinions, actively recognize individuals’ contributions and progress, and approach others with the belief that they have positive intentions. We will respectfully collaborate with our stakeholders to plan and complete tasks. We believe that success of our schools and students depends on setting and maintaining high standards for the work we do, that high-quality sustainable services and support for new or continuing accounting and financial systems are foundational to success. Actively engaged employees lead to excellence in service. Therefore, we will use resources effectively and efficiently to meet and exceed standards, be accountable, measure performance, strive for continuous improvement,and continuously explore innovative and new products, practices, and solutions. We will maintain accountability by working collaboratively, respecting our customers and stakeholders, exercising professional integrity, and measuring and evaluating our performance. We believe that every person has value; the racial, ethnic, and cultural diversity of our organization provides a wealth of valuable perspectives; and racial and cultural barriers exist and must be acknowledged and eliminated. Therefore, we will know customers and colleagues as individuals, seek multiple perspectives and relationships from within and outside the organization, proactively review data and practices that speak to racial and cultural inequities, and create growth and advancement opportunities that benefit all employees. 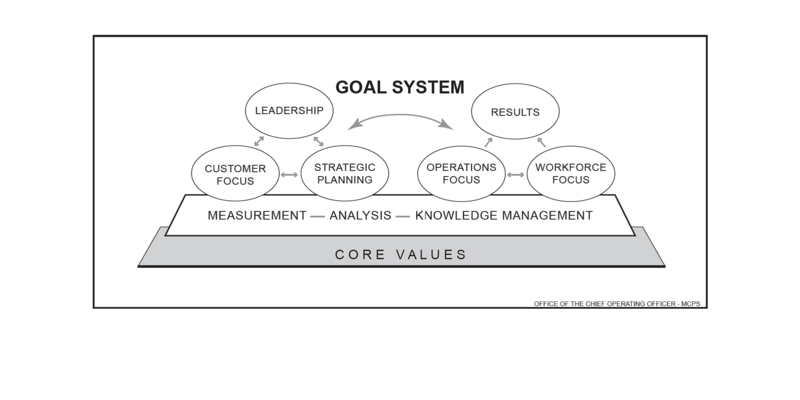 The work for the DOC is grouped using the Baldrige Criteria for Performance Excellence: leadership, customer focus, strategic planning, operational focus, workforce focus, and results. The DOC leadership team focuses on ways to ensure our core values are deployed in our division. The DOC leadership team provides direction, establishes priorities, and models behaviors aligned with our core values. The DOC leadership team builds understanding of the “big picture,” and aligns units’ efforts to support system goals. Promotes sharing information and open communications. As measured by the development, implementation, evaluation, and feedback of action plans created by the DOC, DFS, OCOO, and related performance measures. As measured by the alignment of the DOC strategic plan with the DFS, OCOO, and MCPS strategic plans. Promotes equitable practices by being customer focus. All DOC staff understands and anticipates customer needs and provides high quality services that focus on supporting principals, schools, and offices. The DOC communicates processes and the rationale for decisions to ensure customers and stakeholders understand how needs can be met. The DOC utilizes the “voice of the customer” to determine if needs are met in an accurate, timely, and reliable manner. The DOC collaborates with the business community and peers to adapt quality practices and technology that improves the efficiency of its services. High-quality integrated information systems and user friendly tools are in place to help manage information, improve work efficiencies, and support unit operations. Appropriate data (trend, comparison, and benchmark) are accessible to support data-driven decision making and continuous improvement. Data are managed to assure integrity, timeliness, reliability, security, accuracy, and confidentiality. The DOC plans for change and evaluates work processes regularly. DOC collaborates with peers to benchmark continuous improvement practices. Customer and stakeholders have access to and understand DOC processes. The DOC recruits, hires, promotes, and retains the highest quality employees, providing training and development opportunities that support MCPS’ mission and core values. All tenets of Professional Growth Systems are in place to strengthen the capability and capacity of the workforce, including training, mentoring, coaching, and leadership development. Staff development and training are tailored to meet individual and organization needs. Professional Learning Communities are used to build the capacity of staff working and learning together. The DOC promotes the appreciation of diversity and equitable practices in the workplace. The DOC recognizes employee achievements and contributions. The DOC fosters a culture of respect where employees are highly engaged, morale is high, team spirit is evident, and job satisfaction is present. The DOC promotes the social emotional and physical well-being of staff. Employees are trained in the use of current technology as required to perform their work and fulfill the needs of customers and stakeholders. The DOC uses systematic approaches to improve processes and operational performance and to promote innovation. Process management and improvement decisions are driven by data and analysis of customer, stakeholder, supplier, and partner feedback. The DOC is committed to continuously evaluate and develop to meet the changing requirements of a diverse organization. As measured by reports and results of process action teams, reengineering, and other improvement efforts. Promote a collaborative culture with cross-functional to seamlessly accomplish the work of the DOC. Integrate equity action plans as part of the division’s strategic plan. Use the Study Circles process to create a racial equity lens for the work of the DOC and to develop the skills to lead for equity. Use an established quality management system for continuous improvement. Implement action plans at the division. Prioritize tasks for the allocation of resources. Develop a range of recognition activities/acknowledgements of unique or outstanding efforts or accomplishments by individual staff or unit teams.. Develop service agreements that define products and services to be delivered. Develop a range of approaches to promote employee engagement using Gallup survey results. Promote and adhere to county, state and federal regulations in operations and services provided. Communicate the performance results to customers and stakeholders.